ww2dbaseÉdouard Daladier was born in Carpentras, Vaucluse, France. He entered WW1 as an army private, and by the time the conflict ended he had been promoted to the rank of captain and commanded a company. Between 1924 and 1928, he served in various governmental posts and was instrumental in the growth of the Radical Party. By the late 1920s, he had been an influential leader of the Radical Party. He became the French Prime Minister between 31 Jan and 26 Oct 1933, and then again, briefly, between 30 Jan and 9 Feb 1934. In 1936, he served as the Minister of War for the Popular Front coalition. On 10 Apr 1938, he became the Prime Minister of France for the third time. Daladier believed that Adolf Hitler's had ambitions to dominate, by force if necessary, all of Europe, but at the Munich Conference of Sep 1938, Daladier gave in to Hitler's pressure and agreed to cede Sudetenland from Czechoslovakia to Germany; he was persuaded by either Prime Minister of the United Kingdom Neville Chamberlain or the French unwillingness to enter any form of war with another European power, or perhaps both. He was welcomed back into France by a cheering crowd upon his return from Munich, Germany; Daladier reportedly said to his aid "[a]h, les cons!" ("ah, the fools!"). When the Molotov-Ribbentrop Pact was signed in Aug 1939, he outlawed the French Communist Party. When Germany invaded Poland on 1 Sep 1939, Daladier was initially reluctant to go into war, despite the terms of the Franco-Polish alliance, and delayed the declaration until 4 Sep. On 6 Oct, Hitler offered France and the United Kingdom a peace proposal, but Daladier rejected, saying that "[w]e took up arms against aggression. We shall not put them down until we have guarantees for a real peace and security, a security which is not threatened every six months." 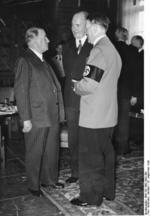 In Mar 1940, he resigned as Prime Minister and remained in the government as the Minister of Defense. When Germany invaded France in May 1940, upon the collapse of French defenses, he fled with other members of government to Morocco in North Africa, but was arrested by the puppet Vichy government for treason. He was imprisoned until 1943, after which he was handed over to the Germans and spent the remainder of the war in the Buchenwald concentration camp. After WW2, he returned to politics as a member of the Chamber of Deputies. Between 1953 and 1958, he was the mayor of Avignon. He passed away in Paris, France in 1970 and now rests in the Père-Lachaise cemetery in Paris. 18 Jun 1884 Édouard Daladier was born in Carpentras, Provence-Alpes-Côte d'Azur, France. 21 Mar 1939 Édouard Daladier resigned as the French Prime Minister. 7 Oct 1939 French Prime Minister Édouard Daladier rejected Adolf Hitler's proposal for a multi-power conference for peace on the previous day. 19 Mar 1940 The French Parliament criticized Prime Minister Daladier for the French inaction during the Winter War. Daladier resigned after a vote of no confidence. 22 Mar 1940 French Prime Minister Paul Reynaud named his predecessor Édouard Daladier as Minister of War despite their opposite political views. 30 Mar 1940 French Minister of Defense Daladier persuaded the French War Committee not to ratify British proposal to mine the Rhine River. British responded by threatening to abandon the plan to mine Norwegian waters. 10 Oct 1970 Édouard Daladier passed away.